These days, observing British politics is a surreal and scary experience. The Tory party conference especially so. I actually thought I’d switched on a repeat of an old UKIP one by mistake when I heard the anti foreigner rhetoric and the plans to make companies ‘register’ all their foreign workers. and ‘name and shame’ them if they don’t employ British workers. After all, the idea is crass enough, xenophobic enough and stupid enough to have come from UKIP, but no. It really is the party of Government who have suggested it. However there was another surreal event at conference, which was to do with the StopHs2 campaign and it was more comical and farcical than anything. 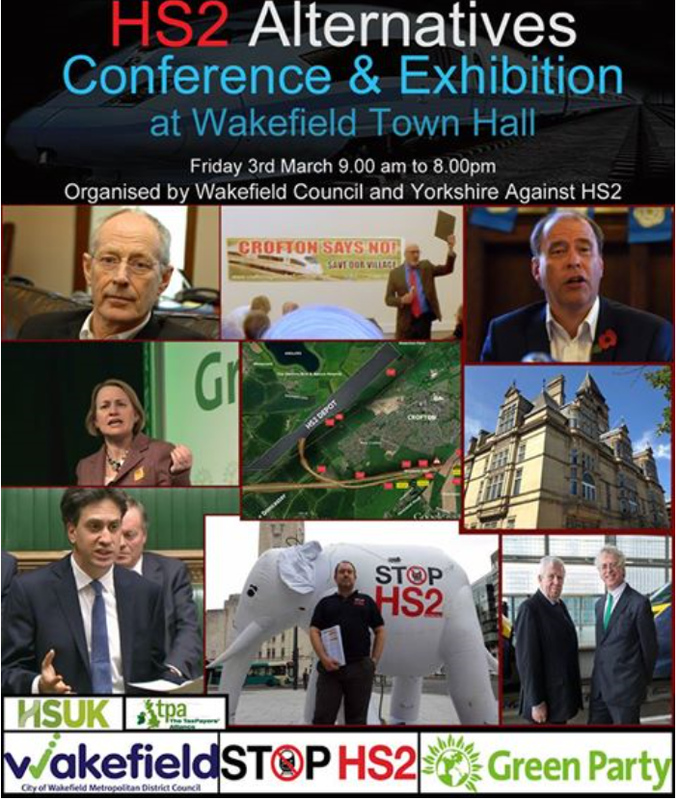 Campaign group StopHs2 ‘launched’ a new ‘briefing paper’ at a fringe meeting yesterday. Laughably they tried to pretend it was bigger than just them by roping in other old names, namely Hs2aa and AGAHST, which is rather amusing as AGAHST bit the dust some years ago, as you can see from their abandoned website Nothing’s been heard from them for years but their former Communications Director, Deanne DuKhan did attend for appearance’s sake. Poor Deanne never did get much right during her time at AGAHST, as this missive she penned in April 2012 shows. A search of the internet doesn’t reveal any trace of her in relation to Hs2 and AGAHST since 2013, which is rather odd as she’s the sole remaining Director! The ‘briefing paper’ that was launched by StopHs2 can be found here. StopHs2 say “The paper will be circulated to all MPs and Lords following party conferences”. Talk about a waste of time! There’s not a cat in hell’s chance of anyone stopping the phase 1 Hybrid Bill this late in the day. MPs won’t be debating it again and the Lords can’t stop Hs2 at 3rd reading, which is expected in November-early December. Plus, if this regurgitation of old arguments couldn’t stop Phase 1, there’s no chance of it stopping phase 2 (even if anyone remembers it by then). Even everyday anti Hs2 protestors seem to have twigged this, as this comment on the StopHs2 Facebook page reveals. Which rather says it all. Today Teresa May closed the Tory party conference with a clear commitment to build not just phase 1 but also phase 2 of HS2. “We will press ahead with plans for HS2” she said, echoing the earlier statement to conference from of her Transport Minister, Chis Grayling. The past few months have been awful for the Stop Hs2 campaign. It’s been rendered pointless by Parliament voting through the Hs2 bill with a stonking majority. Its woes have increased as the bill continues to make solid progress towards Royal Assent. The bill also passed 2nd reading in the House of Lords. Now the Lords has chosen the members of the Committee to hear the 827 petitions. As expected, HS2 antis have stuck in as many petitions as they can, hoping the tactics that failed in the Commons will achieve something in the Lords. The composition of the HoL Ctte (it’s chaired by a QC) makes this far less likely as the committee will be no pushover. They’re expected to be far tighter on procedure than the Commons so expect far more Locus Standi challenges. Meanwhile, the organised anti Hs2 campaign has fallen apart. In 2010 there were four main groups opposing Hs2, this has been reduced to two (Hs2aa & Stophs2) but only the latter is still active. Apparently skint and demoralised, Hs2aa have retreated into representing the Nimby interests of their Directors. Hs2aa have tried the fact by blaming their lack of action on a serious denial of service attack which had taken their website down for a couple of months. Silence them? What they neglect to mention is they still had two other options with which to continue their campaign: Their Facebook page and their Twitter account. So, what’s happened? Nothing. Neither account has seen any action since March 6th! The truth is, most Hs2 antis have given up, even on social media – which has been their main campaigning tool for years.